The Sous Massa basin covers an area of 1,486 km2 in western Morocco, in a very arid region. 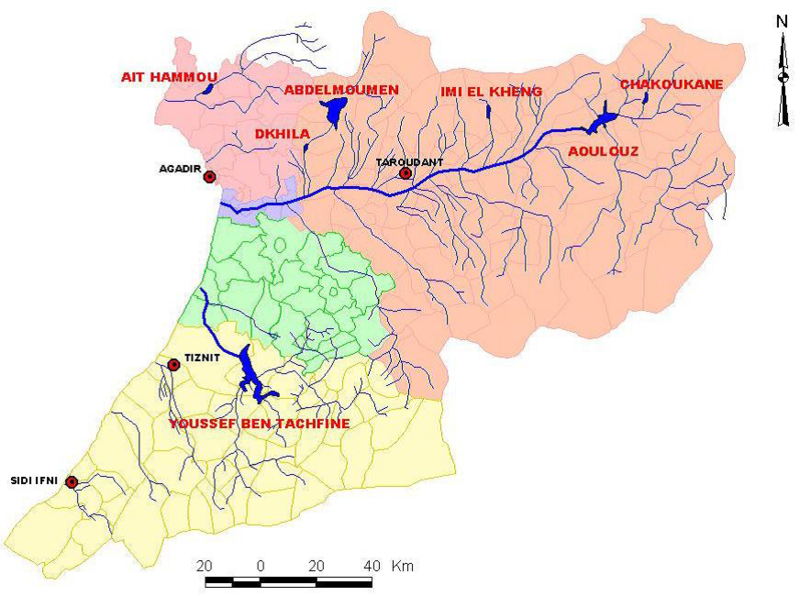 The entire hydrologic basin of Souss-Massa shows a discharge shortfall. It has experienced a 20% decrease in rainfall during the last 30 years. In addition, the quality of water resources has undergone a considerable degradation during the last decades due to the different sources of pollution (domestic, industrial, agricultural wastewaters etc.). This negative balance between water supply and demand is covered by groundwater mining (annual water deficit of 250 million m3 per year), causing a lowering of the water table in average of 3 to 5 meters per year. Most of available natural water (95%) is used for agricultural purposes. This basin is affected by water scarcity, water abstraction, intensive cropping development, as well as sea water intrusion in the coastal area. Annual reports of rainfall, temperature, discharge, turbidity, water quality and socio-economic aspects are available on line. to assess the current recovery levels of the costs of water resources ecosystem services.